Congratulations to our 5th group of Couch to 5k participants! The group of complete beginners started in April, running for a minute at a time. 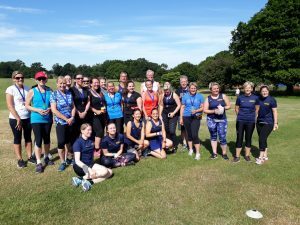 Within just 9 weeks they graduated to 5k, and proved they could go the distance by running at Guildford parkrun on Saturday 23rd June. Lots of Waverley Harriers came along to cheer them along, run with them, celebrate their success – and of course enjoy the celebratory post-run cake! The group progressed to 5k through hard work and determination. They attended weekly group sessions and were given 2 homework ‘challenges’ each week. They provided one another with fantastic peer support, supplemented by a great team of Waverley Harriers C25k ‘run helpers’ who gave buckets of encouragement, motivation and running tips. Some of the C25 grads are continuing to run as part of our ‘5k plus’ group, which includes speed sessions as ‘homework’ and the opportunity to come to Tuesday night track sessions. Most are aiming to do a 10k in September, and to join our Thursday and Sunday runs in future. We wish them luck and look forward to running with them.